Launch of country’s first connected DC fast charging station marks move towards emission reduction for Indonesian transport sector. 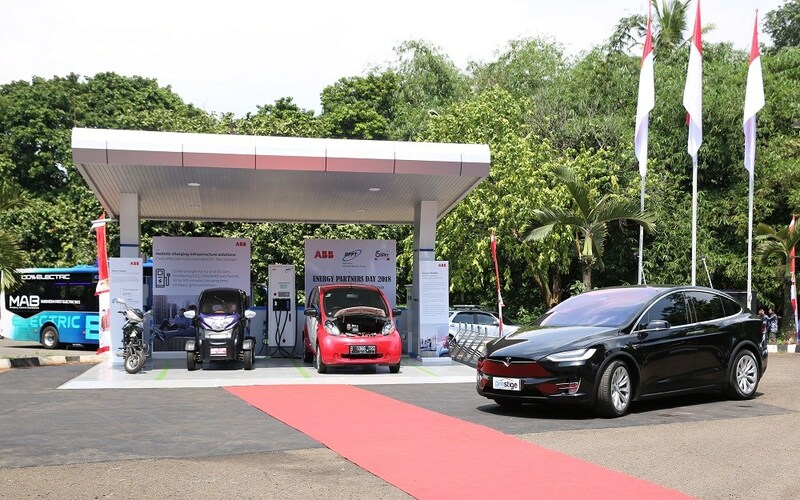 On December 5th, 2018 saw the unveiling of ABB’s Terra 24 CJG DC electric vehicle charging station at the National Laboratory for Energy Conservation Technology, Serpong, West Java. The ABB AbilityTM enabled charging station is one of the first DC fast chargers to be installed in Indonesia. It was commissioned by The Agency for the Assessment and Application (BBPT), a non-departmental government institution under the coordination of the Ministry of Research and Technology, which has the task of carrying out government duties in the field of assessment and implementation of technology. The fast charging station represents a significant step by the Indonesian government in reducing its carbon emissions. Not only is it free to use by the public for the launch event but it also receives almost 25 percent of its power from renewable solar sources. Ganesha Tri Chandrasa, Senior researcher, National Laboratory for Energy Conservation Technology (B2TKE), BBPT explains: “Electric vehicle fast charging is one initiative from Indonesia’s government to accelerate the adoptions of electric vehicles. BPPT is in charge of testing the charging stations to provide the necessary certification. For many years Indonesia has relied heavily on fossil fuel as the main energy source in all economic sectors, ranging from transportation and power plants, to household. Given the high use of oil, CO2 emission rates in Indonesia are among the highest worldwide and transportation has been identified as one of the highest contributing sectors. In an effort to reduce the nation’s carbon emissions and high dependency on limited oil reserves, the government is maximizing the opportunities from Industry 4.0, including the transition to electric vehicles (EVs) and renewable energy for the transportation sector. Indeed, the Indonesian government has developed a national roadmap in electric vehicle adoption with plans to increase EV penetration to 2.1 million electric motorcycles and 400,000 electric cars by 2025. BPPT, working closely with Ministry of Industry and Ministry of Energy and Mineral Resources, is focused on accelerating the adoption of EVs in Indonesia and testing the required charging infrastructure. ABB was chosen by BPPT to supply the Terra 24 CJG DC charging station, a cost-effective multi-outlet solution to charge both AC and DC cars in 30 to 120 minutes. The Terra 24 CJG DC charging station is the most versatile 20 kW charger and does not require a heavy grid connection. A modest requirement for input power make it easy to install at many locations. ABB was chosen by BPPT to supply the Terra 24 CJG DC charging station, a cost-effective multi-outlet solution to charge both AC and DC cars in 30 to 120 minutes. Part of ABB Ability™, the company’s unified, cross-industry digital offering, the charger benefits from web-enabled connectivity which allows the network operator to perform several functions, including remote monitoring and configuring of charging points to resolve driver issues. ABB Ability™ also enables servicing of equipment with minimal downtime and the flexibility to connect to any charging network, back-office, payment or energy management solution. As the world leader in electric vehicle infrastructure, ABB offers the full range of charging solutions for electric cars, electric and hybrid buses as well as electrification solutions for ships and railways. ABB entered the EV-charging market back in 2010, and today has a fast-growing global installed base of 8,500 ABB DC chargers, including high-power chargers up to 350 kW, installed across 69 countries, more chargers than any other manufacturer.